Glassblowers use a wide assortment of standard and custom-made hand tools and equipment in the fabrication of glass apparatus. The examples shown below are representative and commonly seen in the scientific glassblowing industry. The glassblowing process can produce visible and UV light transmissions that are harmful to your eyes. Didymium lenses have been used for years by scientific glassblowers, offering protection from glass shards and providing sodium light filtration. New eye protection products on the market today have been developed for glassblowers and should be looked at specific to the type of glasswork you are doing. 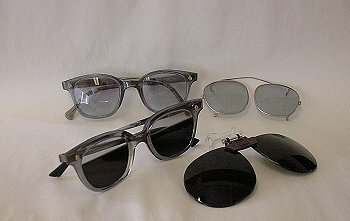 The upper two eyeglasses shown have didymium lenses. The glasses on the middle left are used for quartz work; their upper third contains a didymium lens, and the lower two thirds are a welder's shade 5 or 6, offering additional protection from the intense white light produced when working quartz. The blowhose and the attachments shown are what glassblowers use to blow air into the glassware being made. On the left of the photograph is a latex tube (blowhose) with a mouthpiece at one end and a swivel at the other. The swivel is a device that serves as a transition piece between the blowhose and the glass. The swivel allows glass rotation without any twisting and kinking of the flexible blowhose tubing. Latex or rubber tubes and rubber stoppers of assorted sizes are used to connect to the glass. Swivels (upper right) are usually made of brass or stainless steel. Pictured are two brass swivels, a right angle and a straight swivel. 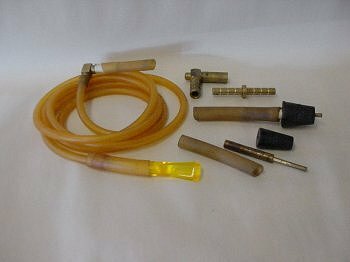 A short latex hose, brass insert and rubber stopper assembly are also shown. Pluro or multi-stoppers, when used in place of the standard rubber stopper, offer a useful variety of glass size connections. 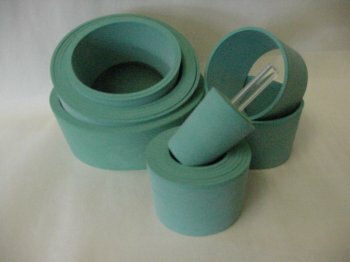 These stoppers consist of a series of "rings" as shown in the photograph. These stopprs are available in different materials for a range of temperature and chemical exposure. Black rubber compositions are good for temperatures up to approximately ~160 °F, green neoprene to about ~200 °F, and the red silicone stoppers are good up to ~450 °F. 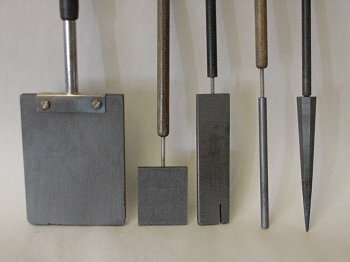 Graphite tools are used extensively in glassworking. They can withstand high temperature exposures and are easy to machine and form into custom shapes, making graphite the material of choice for many glassworking and forming tools. Three flat graphite paddles are shown on the left. Flat paddles can be used in forming flat bottoms on glassware, as an aid in reducing outer diameters on tubing, or in forming an even taper. Note the 3rd flat has a small slit at the base. This was used to produce a small ridge on a glass rod. Graphite rounds can be used to enlarge a hole blown in a tube, as a flaring tool, or to poke an indentation in the glass sidewall. The graphite tool pictured on the right is called a taper. Tapers can be used to create flares with a heavier glass wall thickness. Here we see additional tools found in the glass shop. From left to right, we first see two strikers or flint lighters that are used to light the torch or burner. The striker on the right has a cup that traps the ignitable gas, making it easier to use. Tweezers can be used to pull or hold hot glass or tools. The next two tools are tungsten carbide glass knives or scorers that are used to scratch glass surfaces when "cutting" tubes or rods. 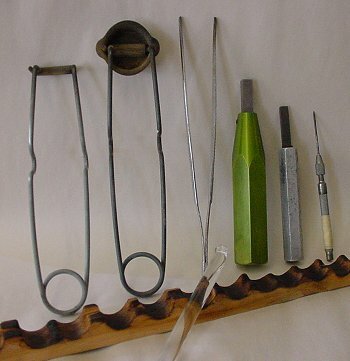 The tungsten pick on the far right is used to move or sew small amounts of heated glass and is most often used to help close small openings found during glass repair or fabrication. The scalloped piece of wood is used as a rest for placing glass (hot or cold) components used during the fabrication process. There are many variables in the glass repair and custom fabrication business, and glassblowers frequently make their own tools and fixtures. For example, here is a simple fixture for flat flange port repairs. Scientific glass apparatus is designed to perform certain functions. To work efficiently (or at all) the glassware must be fabricated to certain specified measurements. Glassblowers will use a number of instruments such as calipers to verify compliance with specifications.